Hi there guys! Pawnina here! Dating is a crucial step on getting to know someone you like. At this early on set of a relationship, you both are trying to read one another, figuring out if you guys can harmonize with your personalities, sync with your interests, intertwine with your . likes and dislikes and eventually hit off the road together. Of course, it’s really admirable to know the qualities of your dates as being creative, athletic, geeky, crazy, funny and all sorts, but had you ever had the chance to date someone who’s actually shopaholic? There’s nothing wrong dating a shopaholic, it’s a flaw that you’ll learn to accept. Shopping doesn’t harm anybody physically, but financially it does hurt and that could be a problem. If you’re a frugal romantic, these telltale signs will give you the heads-up to identify whether your date has a shopping addiction. You cannot deny the fact that shopping is a shopaholic’s way of solitude. Their form of therapy is actually retail therapy. When your dates often find themselves stress shopping to feel better after bad hair days, you got a hint of a might-be shopaholic. You can worry more when you noticed they do that almost every time, then that’s the first check on this list. What can you do to help? Try to make him/her do other stress-relieving pastimes. Find something that can be just as equally or much more satisfying than shopping. Offer a thrill-seeking activity, a fun-engaging new hobby, plus you can never go wrong with food. Their financial goal is to work on the weekdays to cash in their shopping addiction on the weekends. So, if you’re date has no other plans on the weekends aside from going to shopping malls and when during vacations, their top go-to place is a shopping mall, you might be actually dating an impending shopaholic. But let’s not jump into conclusions yet, this is still the second tell-tale sign to watch out for. What can you do to help? Try to make your date set priorities aside from shopping. Inspire him/her to set out other financial goals and motivate him/her to try to work for other things he/she likes. Figure out what else are his/her interests and focus on that area. Just lead your date’s mindset to work for other interesting things aside from purchasing an item that he/she doesn’t need in the first place. They cash out money from their bank accounts and usually, when they go shopping, they go all out. It’s as if their hearts are meant to take the shopping stalls by storm. The unfortunate part, they have no regard for budget management. If they can afford it, they’ll buy it, as long as it makes them feel good. If you’re date has this kind of trait, by now you have a case of a shopping addict to deal with. Because if you don’t, you know you’ll either accept the flaw or be a life-changing partner. What can you do to help? When dating, you can’t just intrude the financial room of your soon-to-be beau. But what you can do is to show how you manage to budget your finances. Explain why you have to make budget lists. Persuade him/her to accompany you to a budget management seminar and justify your interests in attending such. Who knows, your date might have an epiphany afterwards. The eyes are the windows of our souls, and the eyes never lie so they say. You see, when a shopaholic enters a shopping stall, they will really feel that cloud nine rising in. A fascinating thing to witness from such a scene is that their eyes do sparkle. You can see the happiness radiating from within. You’ll notice that shopping is like their first love. When you’re date showed you where he/she finds happiness, then you can qualify him/her as a shopaholic by this time. It is surprising to find out that people who are shopping-obsessed memorize their credit card numbers than their phone numbers. Well, if that’s the case, now you are introduced to the typical shopaholic. Someone who’s obsessed in shopping really has two credit cards or more. This is a sign of impulsive buying as well, because when they don’t have cash, they would always resort to credit cards. It’s no wonder credit cards are their most trusted money provider in case of a shopping emergency. What can you do to help? When you’re at a stage in dating when you listen to your date’s problems, complaints, and rants, then look out for the part when their credit bills bother them out, that’s the time you can assess the situation and offer pieces of advice to cope up with the billing problem. On the other hand, if you noticed your date using credit cards… like a lot, try to share your opinion about it. Although, you might end up making him/her guilty, you can start by comforting and offering any help you can do. For the love of shopping, shopaholics couldn’t wish anything more in the world than to have a full walk-in closet for their purchases. Mostly, the closets of shopaholics are a treasure trove for a fashionista, but a shopaholic is more likely to hoard them than to use them. And there’s a very high chance that they have not yet wear the new clothes they bought ages ago. Now, that would be a serious case for shopping addiction in your watch. What can you do to help? In a shopaholic’s case, a closet that’s like a jungle means budget management issues and a bad habit for impulsive buying. Introduce your date to other places aside from shopping. Show him/her how to be frugal and if he/she tends to go shopping, make your date stop. Offer options aside from shopping and keep track of the places he/she goes. Sale periods are like a shopaholic’s typical holidays. It’s the season when shopaholics flock and go on a shopping spree. Since they are active butterflies on sale periods, they know the time when sales are up on their favorite boutiques and are masters on the best places to go on shopping. So, if you find you’re date begging to want you to accompany him/her at sale periods, you are falling for a shopaholic. What can you do to help? They’ll just eventually lose control with their decisions when they’re on their own shopping, since their goal is to just “shop”. You can come with him or her to help them decide. Plus, with you around, you can be their breaks and pull them away from impulsive buying. You know when you love something, you’ll do anything to get it, and there are no excuses. Well, a shopaholic always justify his/her reasons to purchase the item. When you find your date giving enough reasons to buy something he/she wants but doesn’t necessarily need it, yes you got a shopaholic. What can you do to help? You can rebut his/her reasons. Give a decent excuse to touch his/her conscience. You may give him/her second thoughts and you’ll empower his/her will to avoid shopping soon enough. They frequent the shopping stores and become a favorite. They know who to talk to and the sales people know what to offer. They trust them more than they trust themselves in shopping. They give in to the offers and most likely leave with a lot on their shopping bags. 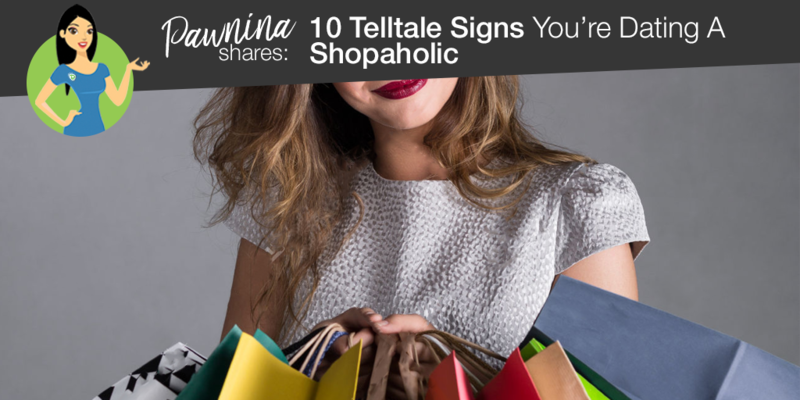 Shopaholics are a favorite customer because they always end up leaving with something. What can you do to help? Be more trustworthy than the sales people. Give your opinions. That would be a good start to start thinking before shopping. Generally, they feel anxious and worry that their family or you would notice them purchasing another item, disgusted over the fact that they lack the willpower to overcome their shopping spree, overwhelmed for the thought of having to stash another item in his/her closet, and hopeless from thinking when they will be able to stop. What can you do to help? This is when they are their most vulnerable. So you can start by asking him/her to open up and then offering your help to solve the addiction. You can bring her to counseling and be his/her person all throughout. Shopping is really fun, but too much of anything is sometimes bad for you. For more tips and tricks about shopping, you can keep visiting our Pawnhero website. Speaking of shopping, Pawhero marketplace by Pawnhero is your newest online shopping store. So go check it out! And do like Marketplace by Pawnhero on Facebook and download our Pawhero app for more.